The most important device required for this software to work, is a GPS or RTK receiver. 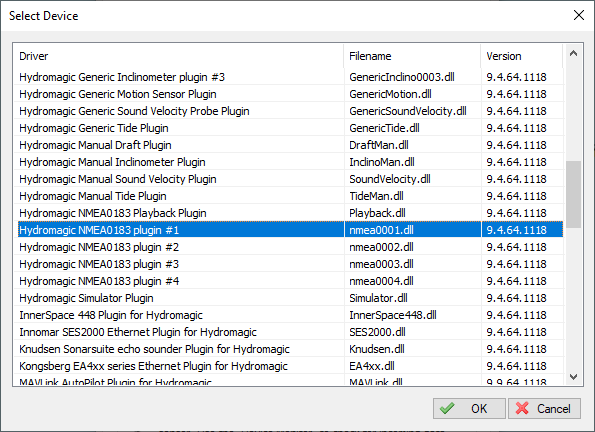 At this moment, all GPS and RTK receivers with a NMEA0183 compatible data output are supported. The GPS is used to get position, elevation, course, speed and information on GPS quality and / or precision. When using a RTK receiver in RTK fixed mode, you should be able to get real time tide information as well. Most RTK receivers also have the ability to connect them via Bluetooth. The default serial baud rate for NMEA0183 devices is 4800bps. 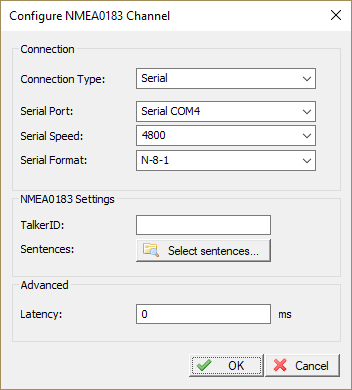 However, some hardware use other speeds (for instance, an AIS receiver will use 38400). When configuring a RTK receiver, the serial speed can sometimes deviate from the standard. 9600, 19200 and 38400 bps are mostly used on these devices. 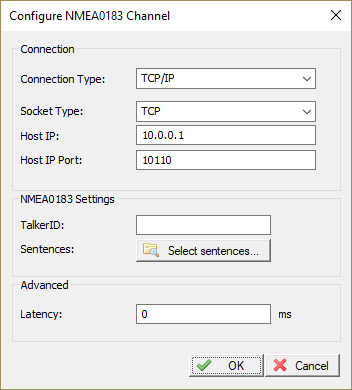 Use the "Socket Type" drop down box to select the TCP/IP protocol used. Possible values are "TCP" and "UDP". 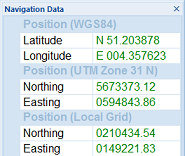 in this case you can either select the GPS or echosounder by specifying "GP" or "SD" in this field. 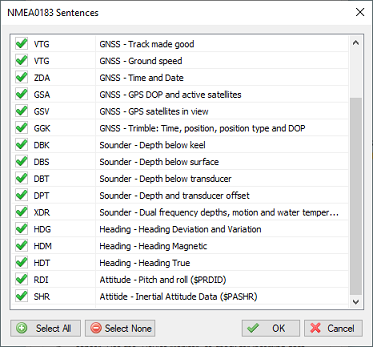 When using a multi constellation GPS or RTK receiver, sometimes sentences are sent multiple times with different talker id's. For instance the data for GLONASS starts with '$GL', the data for GPS with '$GP', the data for Beidou with '$BD', etcetera. 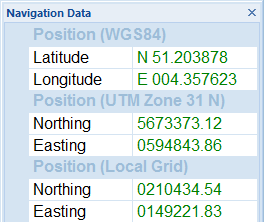 In these cases the combined data starts with '$GN' which stands for GNSS. To avoid duplicate data to be recorded, set the talker id to 'GN'. Good: Only position data with 'GP' talker. No need to set filter. Good: Only position data with 'GN' talker. No need to set filter. Bad: Duplicate position data where only talker id differs. 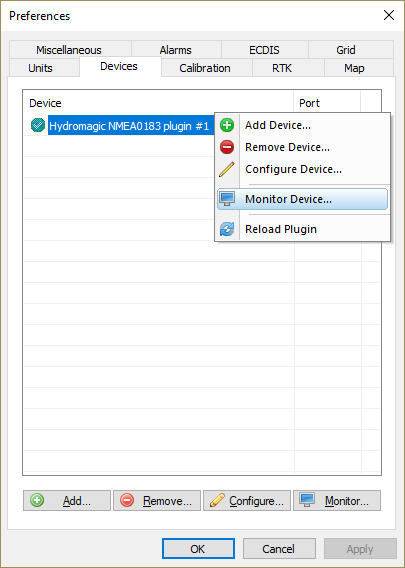 Set filter to 'GN'. For most GPS devices, selecting only the "GGA" sentence will suffice. 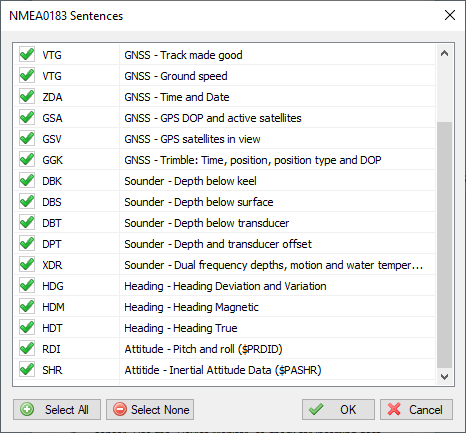 If you choose to use the heading and speed calculated by the GPS device, you should also select the "VTG" sentence. 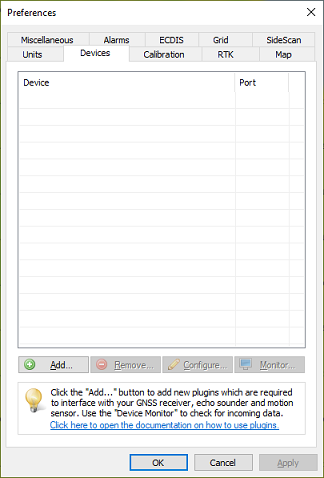 Some GPS receivers use different sentences to send for instance the position data to the computer. To avoid duplicate data, this is something we do not want. The best is to configure the GPS to only output the most important sentences like GGA and VTG. When it is not possible to change the output of the GPS receiver, use the sentence settings to filter out unwanted duplicates. Good: No duplicate data here. 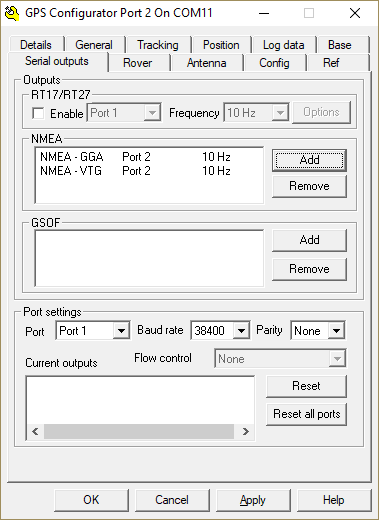 No need to set filter, recommended NMEA output settings for GPS receivers. Bad: RMC already includes speed and heading, so no need for VTG here. Really bad: The same position is transferred using 4 sentences. Use GGA or GGK only. 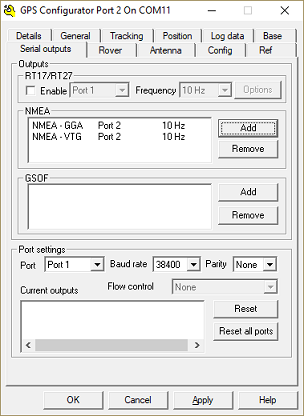 The output rate is the number of times a particular NMEA sentence is calculated and broadcasted by the GPS or RTK receiver. By default, for most receivers, the output rate is 1Hz which equals one time per second. Although Hydromagic works perfectly with an update rate of 1Hz, it is recommended to set it a little higher to improve accuracy. When for instance the echo sounder has an output rate of 10Hz, the Hydromagic software will calculate the positions for these soundings. It is doing this by taking the position before and after the echo sounder ping. The more positions there are, the higher the accuracy. This is especially true when surveying at high speeds, or when there are sudden course or speed differences in your track. We recommend you to set the GPS at the same output rate as the echo sounder, or at least at the closest as possible value. How to set this value differs per GPS or RTK receiver. Please contact your dealer or refer to the manual for more information. the position fields in the "Navigation View" should have green values.